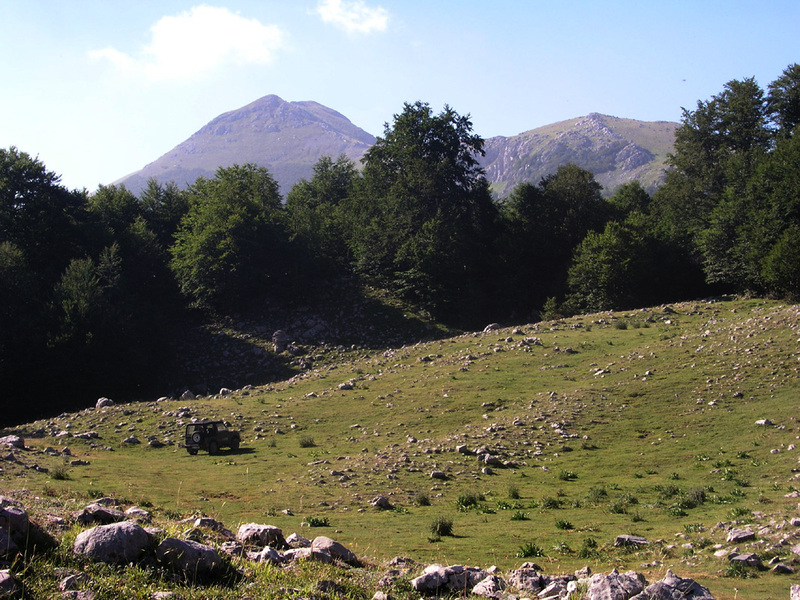 How to get there: This mountain is in Parco Nazionale del Pollino. This national park is located about 180 kilometer south-east of Napoli, in Southern Italy. The park is on the border between the region Basilicata (north) and Calabria (south). Access is via Autostrada A3, also named E-45 running south-east from the city of Salerno all the way down to Reggio Di Calabria on the Strait of Messina. Measured from Salerno, the exit is about 173 kilometer along this autostrada. The exit is 20 kilometer north of the main exit directly east of the village Castovillari, and 11 kilometer south of the Mormanno exit. There is one exit 9 kilometer north of the Castrovillari exit mentioned above (also serving Castrovillari) that should be ignored. Leave the Autostrada at this exit, on some maps this is near a place called Campotenese. Just as you get to the first intersection off the Autostrada (immediately on the south side), start to measure from here. Go right, parallel to the Autostrada and cross it on a bridge, proceed 3.5 kilometer (you should be north of the Autostrada! ), then make a sharp right. Continue along the road as it climbs the mountain, including 4 switchback turns. At kilometer 13.2 you will cross the ridge in a distinct col (Colle del Dragone) and continue on the north side. At kilometer 14.2 keep right (a road forks left here). Shortly after, you will pass Rifugio De Gasperi on your left as the road curves right. The trailhead is at kilometer 19.2. The trail exits sharply right uphill from the road. The road has just completed a left curve and has started a downhill slope. There is limited parking on the side of the road here. The elevation is 1548 meter, the coordinates of the trailhead are N39:56.045, E016:09.692. From the coast, the distance from the village of Scalea to the trailhead is about 70 kilometer and will take about 1.5 hour to drive. This road is partly narrow with a large number of curves. Route description: From the trailhead, start out up the big trail (4WD quality), there are signs telling that motor vehicles should not enter. Very shortly, you reach the first pass named Colle Dell'Impiso. The trail continues downhill and after about one kilometer you are on the valley floor, a nice flat area with grass. The trail forks here, going right will take you to the pass Colle Gaudolino, appropriate for a climb of Monte Pollino. Take the left branch and continue along the trail as it climbs staying in the hillside on the right side of the creek. At a small clearing in the forest, after about 2.9 kilometer, what looks like a trail forks left, ignore this and continue uphill on the main trail. You will reach the end of the road after approximately 3.6 kilometer at elevation 1776 meter, location N39:55.017, E016:11.814. From here, a large pretty flat grass area continues and forms the upper part of this valley. 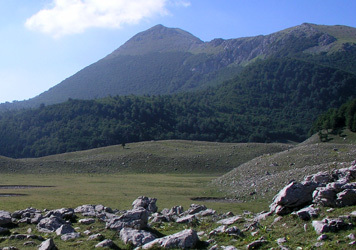 You now see Dolcedorme straight ahead and its north-west ridge connecting towards Monte Pollino on your right (south) side. The route continues a little more than one kilometer across the grass and turns right into the area closest to the saddle between the two mountains. Near the end of the grass at location N39:54.480, E016:12.166, elevation about 1800 meter, a clear trail heads into the forest and climbs the slope to the lowest col between Monte Pollino and Serra Dolcedorme. From this saddle, the best route will head a bit left (north) of the false summit that you see in front of you. A small trail traverses below this false summit, then follows the ridge before climbing the final west slope of Dolcedorme. I give map elevations on peaks in this report, while saddles are given using my GPS measurements since many saddle elevations are unavailable from the map. The prominence of Monte Pollino and Serra del Prete has been computed using the difference between my GPS data, thus what may look like an inconsistent computation is really a best possible estimate. Comments: I did this hike with my son Pål Jørgen, age 16. We left our hotel in Scalea (on the coast) at 0600 and started hiking from the trailhead at 0750. We were at the end of the 4WD road after about one hour and made the summit of Serra Dolcedorme at 1030. We spent 30 minutes at the summit, unfortunately, the horizon all around was really hazy preventing good panorama pictures. A trail register placed by Club Alpino Italiano was well kept in a solid case. We decided to do a "Grand Traverse de Pollino" and thus, our M5 trip continued to Monte Pollino. A first view of Dolcedorme, a local shepherd has driven his jeep to here. 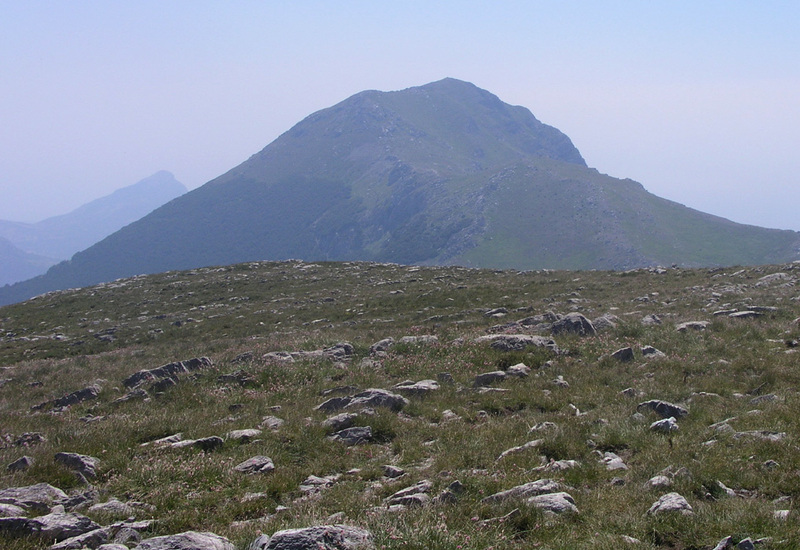 Serra Dolcedorme, as seen from Monte Pollino.